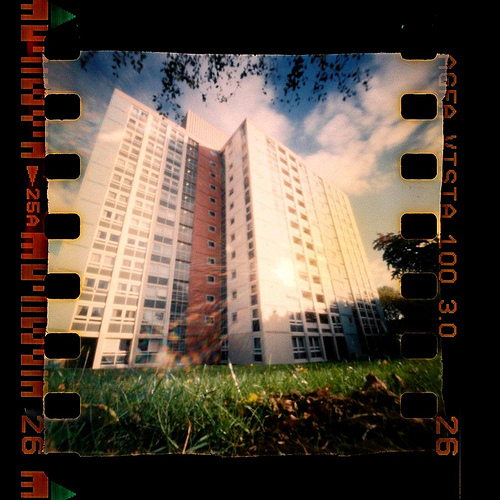 Most modern LCD displays use the backlight technique – the semi-transparent image on the LCD panel is lighted from the back, and the visible image is formed by the light passing through the matrix and filters. A rather bright white light source should be used as a backlight, because the LCD matrix is quite dark – comparable to dark sunglasses. Traditionally cold cathode fluorescent lamps (CCFL) were used for that. This lamps look as thin (2-3 mm in diameter) white glass tubes. The inner surface of the tube is covered with luminofore, and the tube is filled with mercury vapor. When an electric voltage is applied to gas, it is ionized, making the luminofore glow. 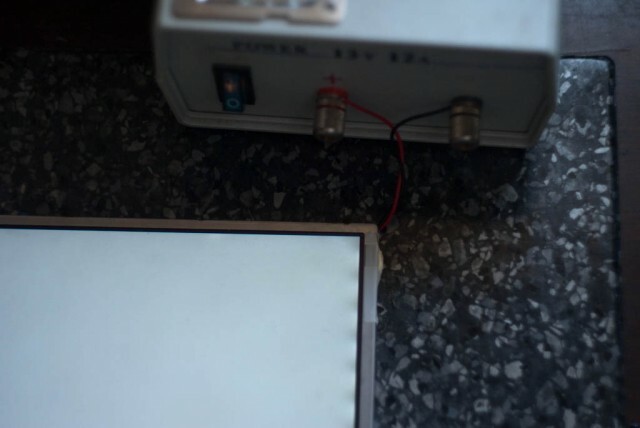 For CCFL, you need to supply it with high frequency (40-50 kHz) alternating voltage of about 1500 V.
One of the most common failures of LCD panels is breakdown of backlight or invertor – a device which transforms DC voltage of about 12-18 V into AC foltage for the lamp. You can notice that either in partial darkening of the screen, usually near one of its sides, or in complete darkening – in this case you can see the dim image only when you light the screen with a bright lamp. 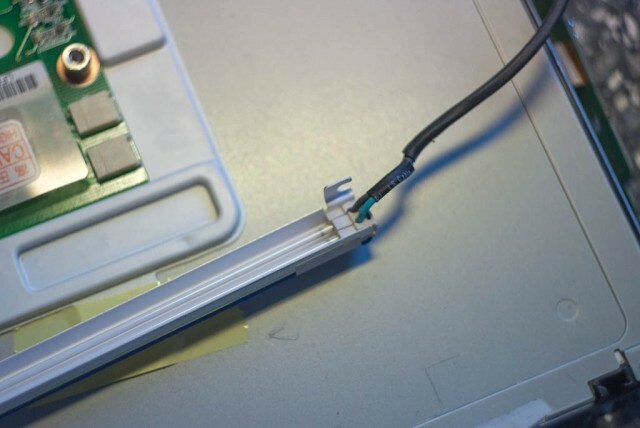 In authorised services this malfunction is repaired by changing the entire panel, especially in case of notebook screens. That is quite expensive, and the price can be compared to that of a brand new display. Luckily, there are not only authorised services, but a quite large number of “handymen” who are able to replace the backlight or inverter. Replacing of a backlight lamp is quite easy, and is sometimes possible without full disassembling of a display. It is described in Igor Pichugin’s article at RadioCat website, as the article is in Russian, I’ll briefly retell it. The lamps are mounted along a side of a display in special casing. 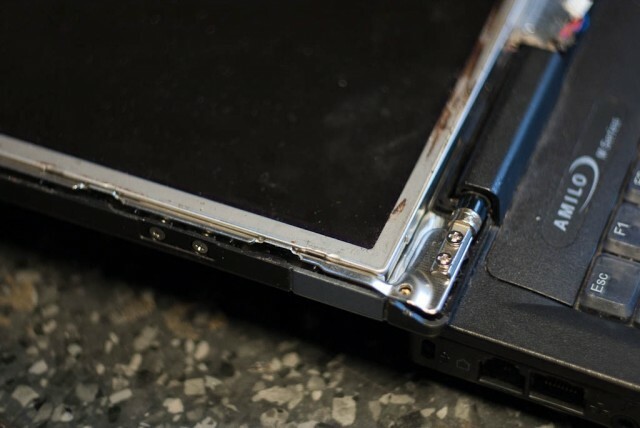 To dismount the casing, you need to disassemble the panel – take off the metal case and the glass panel with some electronics. 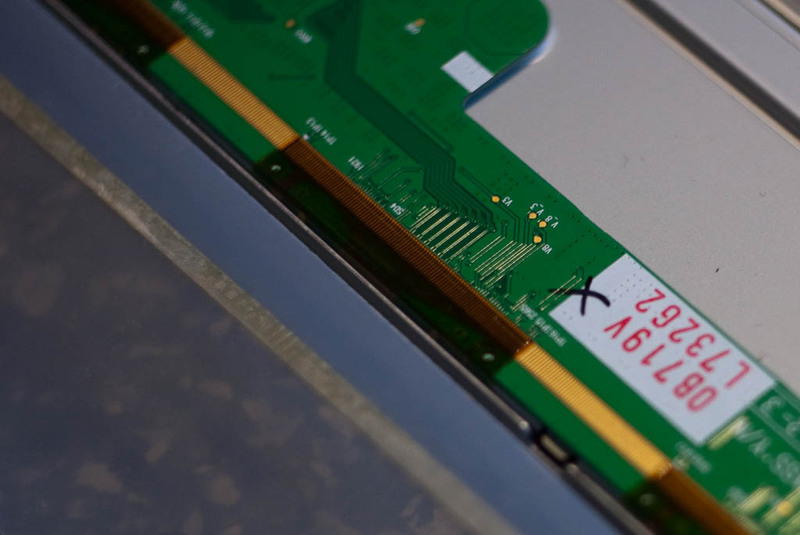 The electronics is a thin (0.5 – 1 mm) circuit board, connected to the glass panel with some flat ribbon cables. 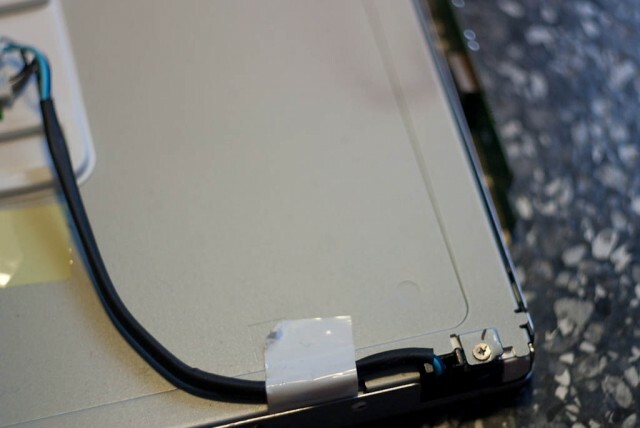 The cables are protected with sticky film, which you have to unglue carefully (never cut it! 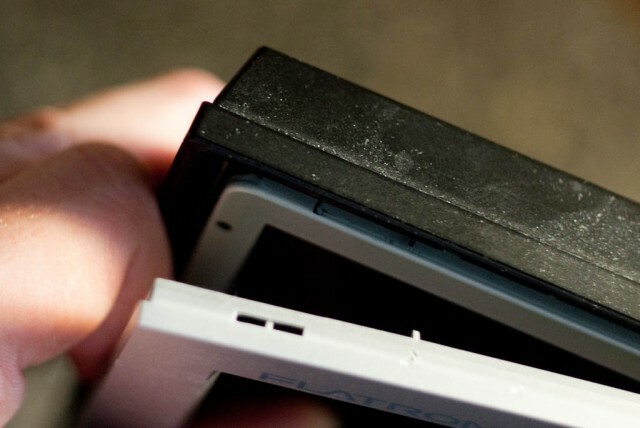 if you accidentally damage the ribbon cables, you will be unable to repair them). 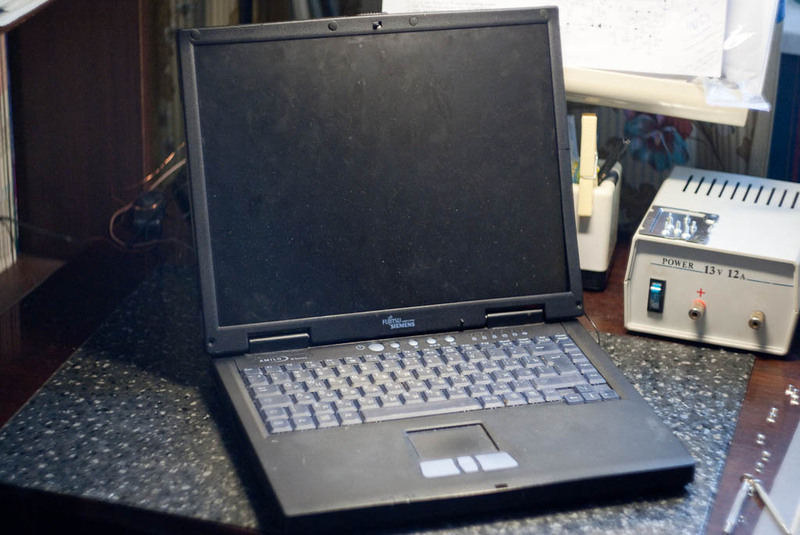 For demonstrating of “classic” CCFL technology I use the LG Flatron L1970H display. The disassemly begins with removal of a stand. 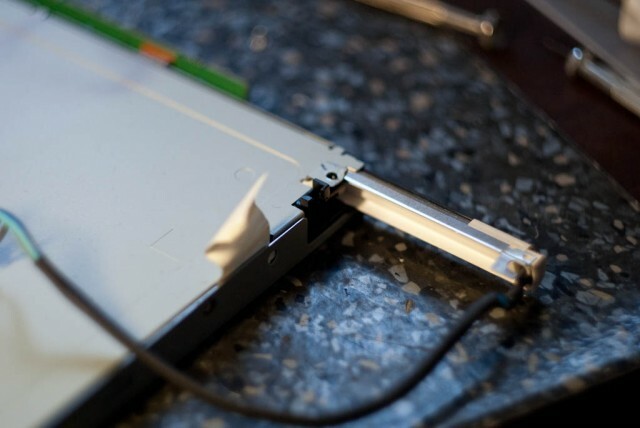 You need to take off a plastic cover in the back, which hides the connectors and screws of the stand. After removing the stand we can disassemble the plastic case. 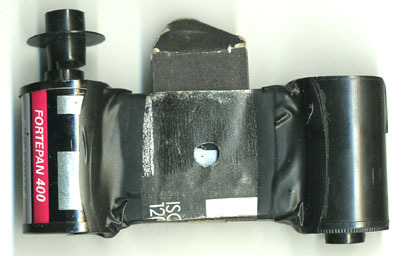 The front bezel is mounted on several clips and can easily be removed. 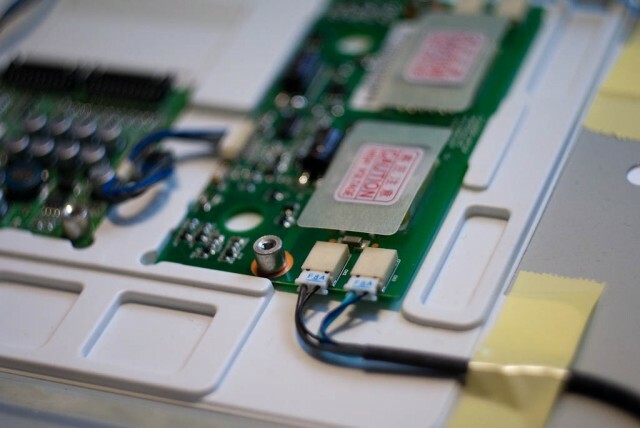 The LCD module is in its metal case. Through the holes you can see the transformers of the invertor with scary cautions. 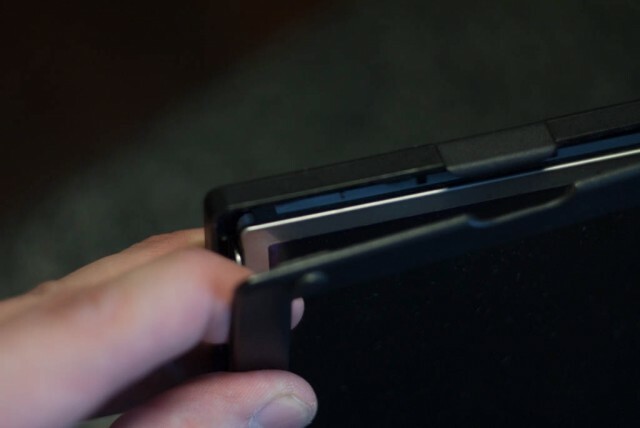 Unscrew the case and remove the metal covers. We can see the control board of the display and a separate inverter board. 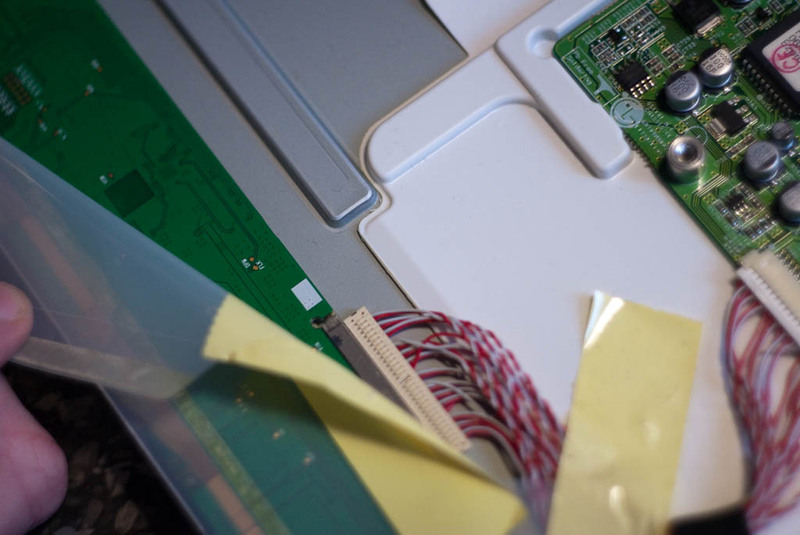 The control board is connected with the decoder of the matrix, the latter is covered with protective film. The decoder is connected to the matrix with thin flat ribbon cables. 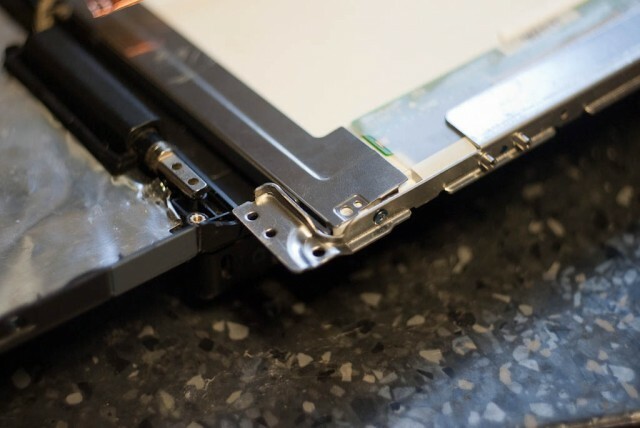 It you have to take off the matrix, you have to peel the protective film carefully – the damaged cables can not be restored, and any damage to them renders the matrix unusable. 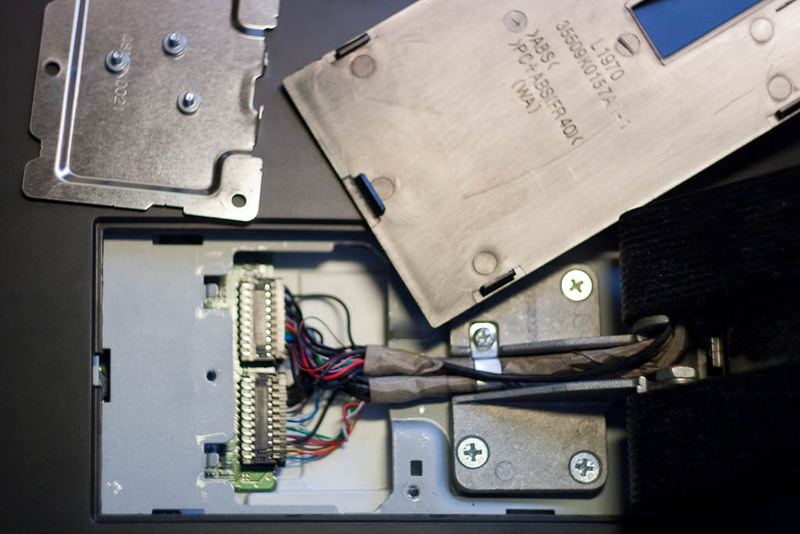 The inverter, if broken, often can be changed to a compatible one. You need to know the supplied voltage and the number of the lamps. Also, the inverter is quite big, and often can be repaired with widespread tools. The lamps are connected to the inverter by standart plugs. …and pull the lamps casing. The lamps are mounted in pairs. You can distinguish an old lamp by a dark ring across its end. When the lamp ages, the ring gets darker an darker. I needed the lamps to test the inverter of a notebook PC Fujitsu-Siemens Amilo M7800, which had symptoms of backlight failure. The authorised service charged incredible money for replacing the panel, so I decided to use Igor’s article to revive this PC cheaply. To access the panel, you should take away the besel. It is mounted on clips, but sometimes there may be screws fixing it. In the lower part of the display one can see the inverter in protective case. 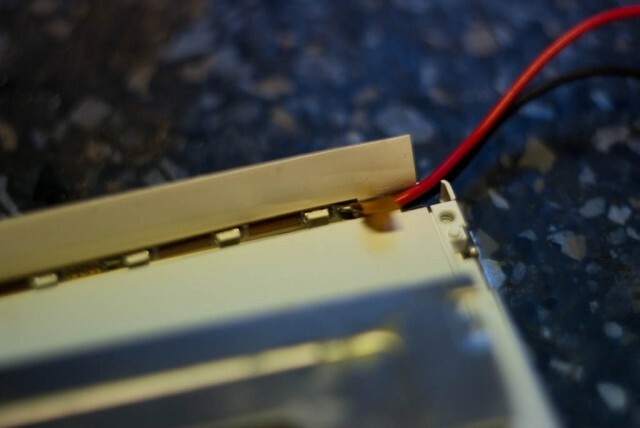 To test the inverter, you should connect a working lamp to it. 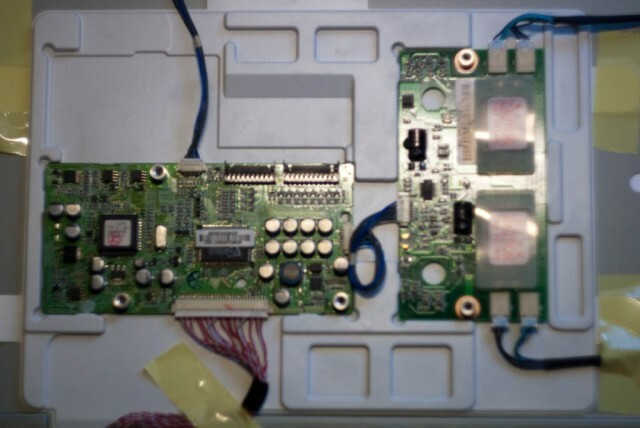 If the inverter of a notebook appears broken, it is considered unrepairable and is replaced by another one. If you can not find the original part, you can try to use “compatibles”, which can be found in many shops, including online, such as Dealextreme. When replacing the inverter one should be sure about control signals of dimming and switching on/off. The cable of the inverter usually contains DIM and ENABLE signals, which change from 0 to about 3 V (always measure actual values! ), 0 V means disabled/zero brightness, 3 V means enabled/full brightness. Usually their proper commection is not mandatory, but it allows to use power-saving features. 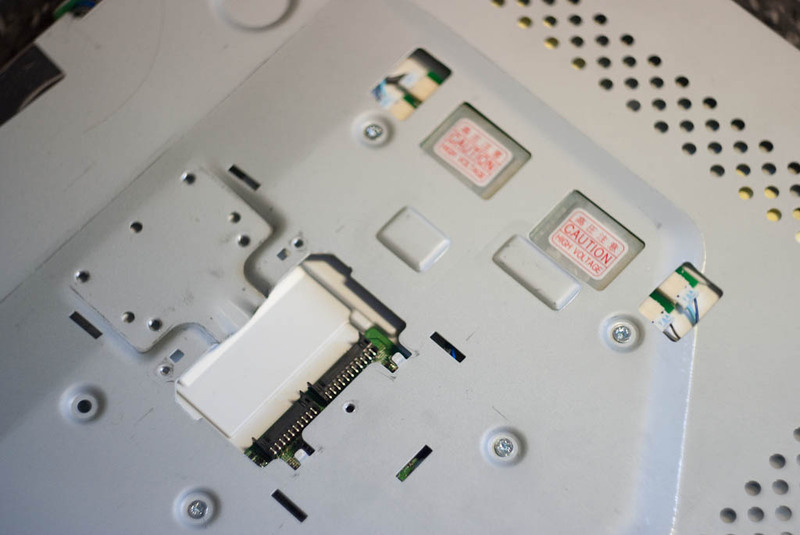 To replace the lamp we need to take off the LCD panel. Unscrew its mounting to the plastic cover and hinges and pull out. 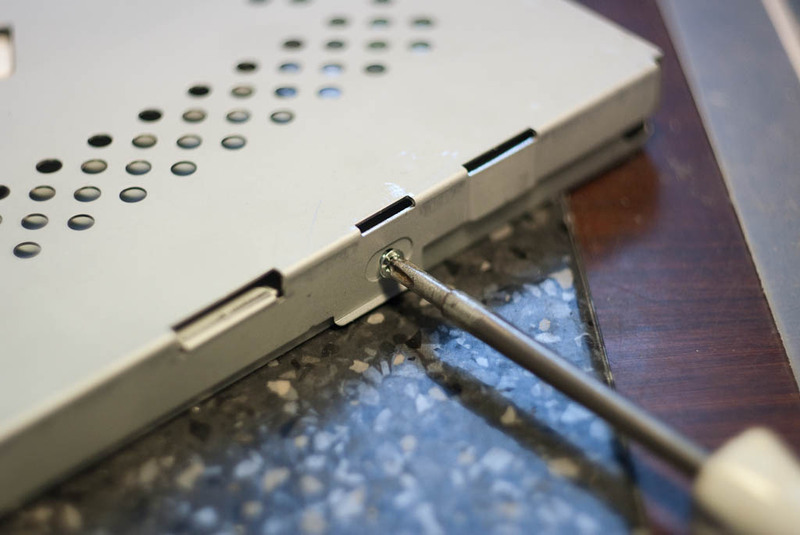 Take off the metal guides on the sides of the panel. In this panel you can get to the lamp without full dismounting. You only need to take off one side of the metal frame and open the plastic case. The following seemed to be obvious – go to a spare parts shop, buy a lamp and put it on its place. But there were no shops with the lamps of the needed length in Moscow. At Mitino market I was advised to use a LED line designed specially for backlighting LCD panels. 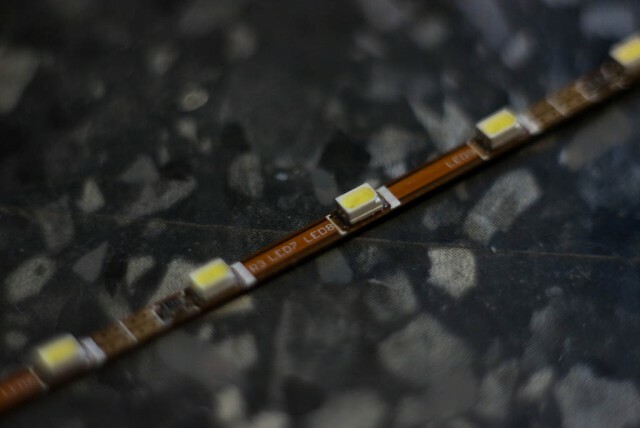 A width of this LED line is about 3 mm. 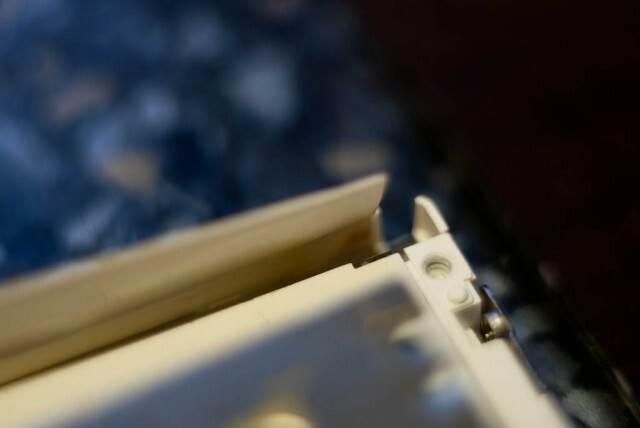 The diodes are grouped by three, with the length of each group about 15 mm, so you can cut the needed length. Today, when ultra-bright white LEDs are easily available, LED backlight is installed in some LCD displays and TVs. Really, anyone can touch this breakthrougth technology, installing LED line backlight instead of a broken “lamp”. The 300 mm line which I bought costs about 8$ (250 roubles, which roughly equals the cost of a spare lamp). The LED line perfectly fits on its place. To test the LED backlight we need to connect it to any suitable power source (we need 12 V DC, observe polarity :) ). The unplugged screen should glow bright white. The resistor values may vary in different notebooks, so I do not write them here – knowing DIM/ENABLE parameters and supply voltage, one can easily calculate them. Finally, a few words on disadvantages of home-made LED backlight. First of all, LED spectrum differs from CCFL spectrum. If you need accurate color reproduction, i. e. on a high-quality graphic workstation display, you should use only CCFL. Also, there exist “smart” inverters which are controled not by analog voltages but by some digital bus, usually I2C, but more exotic variants exist. 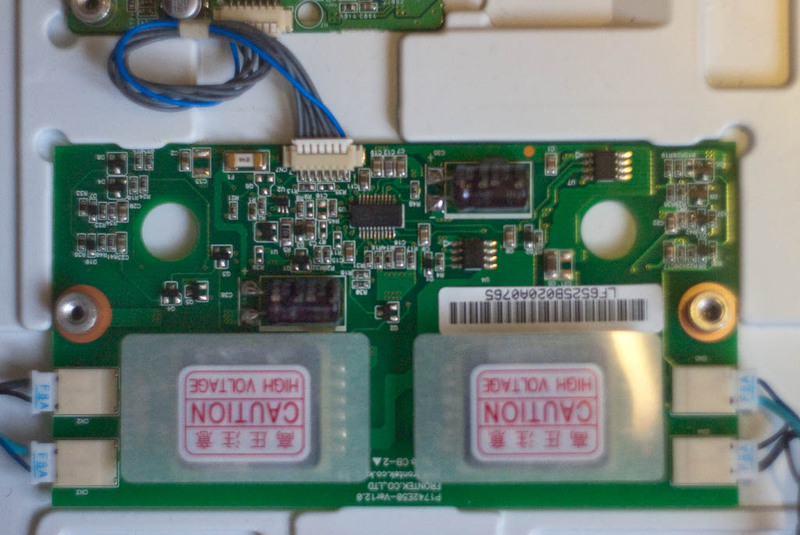 If such inverter is absent, the LCD may automatically switch off. 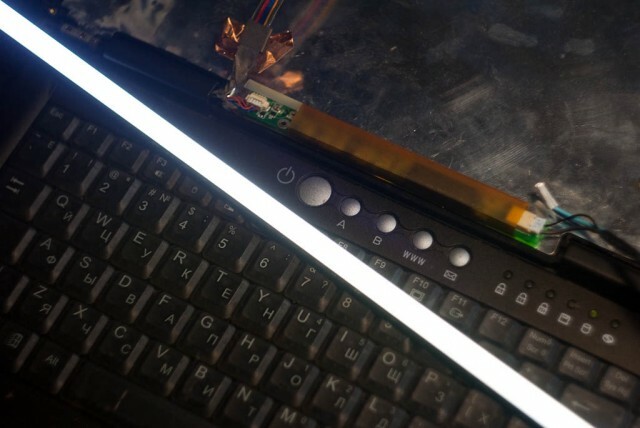 The third and main bad feature of this “do-it-yourself” backlight is non-uniform lighting near the lamp. In the photo you can notice that the lower part of the display has some darkenings, and the lower right angle is completely dark as the LED line happened to be short a bit. 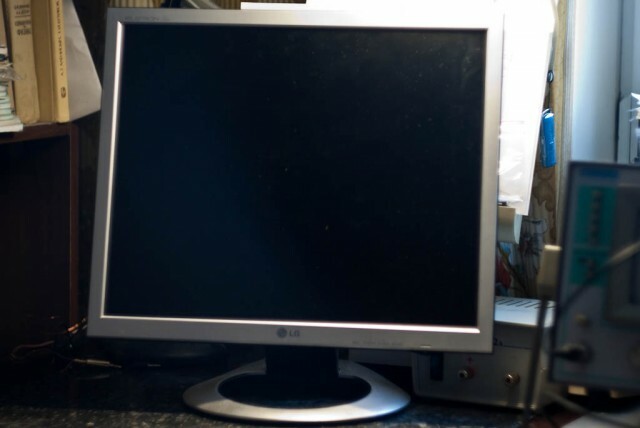 In any case, replacing a CCFL lamp with LEDs can be a cheap and easy way of restoring LCD displays. The drawbacks are not critical, and in case of non-standart lamp lengths it is quite a reasonable decision. Обсуждаем тут с golergka систему App Store – эппловский магазин софта для яблофона. Суть моих претензий к этой системе состоит в том, что участие в ней для программиста сопряжено с совершенно кабальными, по меркам shareware, условиями. Распространение программы требует регистрации разработчика в iPhone Developer Program, которая стоит минимум 99 долларов в год. Комиссия Apple, взимаемая при продаже программ, составляет 30%. Программа может быть отклонена по множеству причин. Как утверждает Макс, все это делается для того, чтобы программы для iPhone удовлетворяли некоторым “стандартам качества”. По результатам обсуждения мы пришли к выводу, что “стандарт качества” для программ сводится к “поставилась-запустилась-удалилась-систему-не-запортила”. Как вы считаете, можно ли на современном уровне развития технологий реализовать систему, удовлетворяющую этим требованиям? На один форум “любителей истории русско-японской войны” заявился некто, называющий себя продюсером нового фильма о крейсере “Варяг”. Как я однажды пытался объяснить golergka, режиссер и сценарист любого фильма должны иметь довольно серьезное представление о предмете, чтобы не снять что-нибудь наподобие “АдмиралЪа“. Если же таковое отсутствует, то принято (в странах с нормальным кинематографом) приглашать консультантов, являющихся специалистами по данному вопросу. Думаю, если в “натурально-американском” фильме как-то “неправильно” показать, к примеру, Джорджа Вашингтона, то фильм будет обруган критиками. У нас же очень вольное обращение с фактами – в порядке вещей. Сценарист может заявить консультанту – “а я так вижу” в ответ на любое его замечание. Вернемся к “Варягу”. В 1946 году сценарист Г. Гребнер написал сценарий фильма “Песнь о «Варяге»”, изобиловавший перлами вроде “Вестовой спал в командирском кресле. Старший офицер, тихонько приоткрыв дверь в салон командира, потихоньку заглянул в щель, а затем на цыпочках прошел к столу, где остывал ужин, и полюбопытствовал, что же изволит кушать командир, приподняв крышку на блюде”. К счастью, в это же время вышло Постановление ЦК ВКП(б), в котором отмечалось, что “главный недостаток в работе авторов сценариев, постановщиков и режиссеров заключается в том, что они не изучают дело, за которое берутся, в результате выходят на экраны негодные фильмы”. Назначенные в съемочную группу консультанты – капитан первого ранга С. Юрьев и инженер-подполковник В. Токаржевский жестоко переделали сценарий, в результате чего получили вполне приличный фильм, который даже получил в 1947 году Сталинскую премию. Премию дали и сценаристу, неясно, правда, за какие заслуги. Как я понял, сабжевый продюсер пришел на форум за бесплатной консультацией. Делается так по простой причине – не надо показывать сценарий какому-то там “консультанту”, который половину похерит, да и денег платить “коллективному разуму” не надо. Зато в официальный пресс-релиз идет замечательная фраза: “дома висит фотография прадеда моей (режиссера) жены, служившего на броненосце «Николай I», который нанес самый серьезный урон японскому флоту во время сражения при Цусиме. Сейчас очень важно снимать фильмы о русской истории для будущих поколений, чтобы настоящие герои не были забыты, и молодежь могла гордиться своими предками”. Чем знаменит броненосец “Император Николай I”, он же “Ики”, думаю, напоминать не стоит. Вариант первый. С розовыми соплями и гейшами. 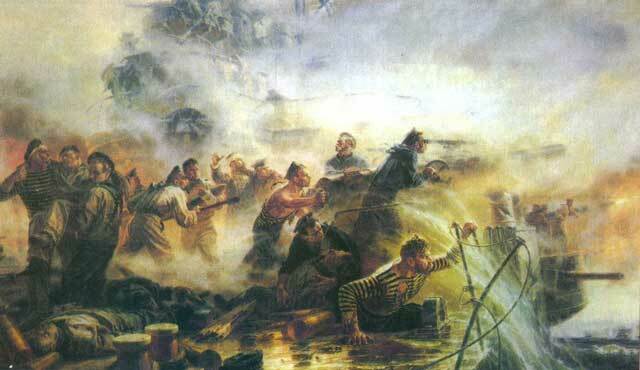 1880 год. В японский порт Нагасаки прибывает находящийся в кругосветном плавании русский крейсер “Африка”. Молодой мичман Всеволод Руднев влюбляется в гейшу Сунь-Хуй-В-Чай. Тут идут постельные сцены, розовые сопли, тайны японского секса и прочая и прочая и прочая. К сожалению, любовная идиллия японской гейши и русского мичмана длится недолго. Всевородо-сан вынужден покинуть Нагасаки и вернуться на крейсер. Через девять месяцев, как водится, у гейши родится сын Вынь-Су-Хим. Дальше идет долгое повествование о судьбе Выня, как тот поступает в военно-морское училище (под рассказы матери “твой отец тоже был джедаем”), терпит насмешки однокашников по поводу своего “неяпонского” разреза глаз и неблагородного происхождения, но все же в 24 года становится командиром миноносца “Касасаги”. Тем временем Руднев делает карьеру в русском флоте, становится капитаном первого ранга и получает под командование крейсер “Варяг”. 27 января 1904 года их пути пересекаются. Блокированный японским флотом в корейском порту Чемульпо “Варяг” идет на прорыв, топит крейсер “Такачихо” и наносит повреждения флагманской “Асаме”. Японский адмирал Уриу приказывает отряду миноносцев “во что бы то ни стало” остановить “Варяг”. “Касасаги” прорывается вплотную к крейсеру, выпускает торпеды и наносит ему тяжелые повреждения, но и сам гибнет под огнем орудий “Варяга”. Молодой японский капитан уходит на дно вместе с кораблем, зрители пускают слезу. “Варяг” вынужден вернуться в порт, где его затапливает команда. В плену (горячий привет “Военно-историческому журналу”) Руднев узнает о происхождении комадира потопленного миноносца, догадывается, что это был его сын и делает себе харакири деревянной щепкой. Японцы посмертно награждают его “Орденом Восходящего Солнца” и хоронят с самурайскими почестями. Прогноз: фильм многократно окупается в прокате благодаря уникальному сочетанию японского секса и батальных сцен, охаивается на форумах, а Руднева производят в АдмиралЪы и ДжЫдаи под именем Дарт Руднев. На Первом канале в новостях ежедневно докладывают о новых коммерческих успехах нового российского мега-блокбастера. На форумах убедительно доказывают, что харакири деревянной щепкой сделать нельзя. Вариант второй. Как говорил Уинстон Черчилль, “традиции королевского флота – это ром, плеть и содомия”. 28 января 1905 года. Каюта командира американской канонерской лодки “Виксбург” Лери Брукса, порт Чемульпо, Корея. Брукс пишет донесение о произошедшем накануне бое японской эскадры и крейсера “Варяг”. Дальнейшее – его воспоминания, начиная с событий месячной давности – прихода “Варяга” в Чемульпо. Стареющий пидор Джеймс Бэйли, командир английского крейсера “Тэлбот” и начальник международной эскадры, стоящей в Чемульпо, замечает среди русских офицеров красивого молодого человека, графа Алексея Нирода. Намеками он пытается добиться от Алексея пидорской взаимности, но тот не понимает “ухаживаний” Бэйли. Наконец, вечером 26 января под цветущей сакурой два пидораса объясняются друг другу в любви (карманный историк подсказывает, что в январе сакура еще не цветет, да и для пидорских утех на природе холодновато, да и хрен с ним), за чем их замечает Брукс, который не без ханжества отмечает это в своем рапорте. На следующий день в Чемульпо приходит японская эскадра. Командир “Варяга” Руднев в ответ на ультиматум японского адмирала Уриу принимает решение прорываться. На совещании командиров кораблей международной эскадры Бэйли понимает, что его любовнику грозит опасность и пытается убедить Руднева затопить крейсер в порту и интернировать команду. Руднев отвечает решительным отказом. “Варяг” и канонерская лодка “Кореец” идут на прорыв. Камера показывает судовые оркестры итальянского и французского стационеров, играющие русский гимн. На английском же корабле Бэйли манерным жестом останавливает оркестр. Первым же выстрелом японцы разбивают дальномерный пост на “Варяге” и смертельно ранят Нирода, который перед смертью произносит имя “Джеймс…”. Лишившись дальномера, “Варяг” неверно определяет дистанцию до японских кораблей, и не может добиться попадания. В то же время японцы, пристрелявшись, наносят русскому крейсеру тяжелые повреждения, и тот вынужден вернуться в порт. Узнав о гибели Алексея (или еще лучше – Алеши), Бэйли пускает тяжелую мужскую слезу и принимает решение разместить моряков с затонувшего “Варяга” на “Тэлботе”, а на требование японцев выдать им пленных отвечает, что команда “Варяга” является потерпевшей кораблекрушение и находится под защитой Великобритании. Прогноз: фильм получает скандальную известность благодаря натуралистическому пидорству еще до премьеры, идет в минимальном количестве кинотеатров, малочисленные показы приобретают оттенок скандальности. Представители шведского графского рода Ниродов добиваются запрета показа фильма на фестивале российского кино в Швеции. Благодаря военно-морским пидорам и настоящему крейсеру “Аврора” в роли “Варяга” фильм получает “Оскара” в категории “лучший иностранный фильм” и с большим успехом идет в США, становясь первым российским фильмом, который собрал в американском прокате больше, чем “дома”. На форумах в интернете требуют разорвать Нирода на куски, а также убедительно доказывают, что русский офицер никак не может быть пидором. Вариант третий. Для режиссера с приставкой “младший” (например, Вася Залупин-младший). 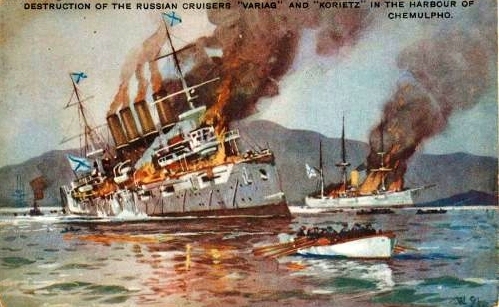 1903 год. Порт-Артур. Лейтенант русского флота Роберт Берлинг (С соответствующей внешностью, не подумайте плохого, я не антисемит. К сожалению, он никак не может быть из семьи пострадавших от репрессий в 1937 году, что сразу идет в “минус”) назначается старшим минным офицером на крейсер “Варяг”. На крейсере процветает “годковщина”, поощряемая остальными офицерами во главе с капитаном Всеволодом Рудневым, пьяницей и матершинником. Увидев, как Руднев издевается над матросом, Берлинг вступается за него, после чего получает надуманное взыскание от командира. Пытаясь навести порядок в своем минно-торпедном хозяйстве, Берлинг сталкивается с непониманием, равнодушием и хамством других офицеров, но ему удается завоевать симпатии матросов благодаря человечному отношению к ним. В то же время развивается его конфликт с командиром из-за письма домой, в котором Берлинг критикует порядки на крейсере, упоминает об отсутствии артиллерийской подготовки, о плачевном состоянии машины крейсера и полном попустительстве командира и офицеров. К сожалению, Рудневу не удается избавиться от “белой вороны” среди офицеров, так как крейсер назначается стационером в корейский порт Чемульпо, но он продолжает унижать своего минного офицера, опускаясь до открытой брани (два раза за фильм называет его “жидом”). 27 января 1904 года в Чемульпо приходит японская эскадра, предъявляющая “Варягу” ультиматум. На совете офицеров “Варяга” Руднев принимает решение прорываться, невзирая на возражения Берлинга о бессмысленности этого – ведь “Варягу” с плохо подготовленными артиллеристами и неисправной машиной противостоят пятнадцать новейших японских кораблей. На слова “людей погубим” Руднев разражается потоком брани. Разумные предложения Берлинга о закрытии орудий и наблюдательных отверстий в боевой рубке противоосколочными щитами остаются без ответа. “Варяг” выходит из бухты и принимает неравный бой. Находящийся в боевой рубке рядом с Рудневым Берлинг видит, как командир ведет корабль на верную гибель, как падают раненые и убитые матросы. Орудия же “Варяга” не добивают до находящихся на горизонте японских кораблей. Внезапно в рубку залетают осколки разорвавшегося рядом снаряда, ранят Руднева и старшего офицера Степанова. Когда те уходят в лазарет на перевязку, командовать кораблем остается Берлинг, намеренно направляющий “Варяг” на камни, чтобы вынудить командира вернуться из-за полученных повреждений. Руднев понимает, что Берлинг саботировал прорыв и грозит тому трибуналом. Крейсер возвращается в Чемульпо, где и тонет. В своем рапорте Руднев упоминает, что при попытке прорыва оставшийся в рубке минный офицер направил корабль на камни, вследствие чего тот затонул. По возвращении в Россию Берлинга ждет суд, но благодаря показаниям матросов его оправдывают и награждают наравне с остальными участниками боя. Финальные титры: “В рапорте Руднева утверждалось, что им были потоплены два японских крейсера и миноносец. На самом деле японские корабли не получили никаких повреждений. На протяжении долгих лет ничем не подкрепленная версия Руднева считалась единственно верной и только сегодня историки могут говорить правду”. Прогноз: на фильм выделяются средства Комитета по кинематографии, режиссер успешно осваивает бюджет, по каналу “Россия” рассказывают о новом высокопатриотическом фильме. Накал патриотизма на “России” увеличивают, когда фильм получает несколько призов на европейских кинофестивалях. В прокате фильм проваливается, на форумах в интернете обсуждают потери японского флота, при этом убедительно доказывают, что артиллерия и машина на “Варяге” были вполне исправны. Берлинга называют жидом много-много-много раз, фильм – “антирусской жвачкой”. Несмотря на это, небыдло хавает, Залупин-младший становится признанным режиссером. Все права на эти сценарии принадлежат мне, могу написать еще чего-нибудь на тему русско-японской войны, возьму недорого. Писать на e-mail. 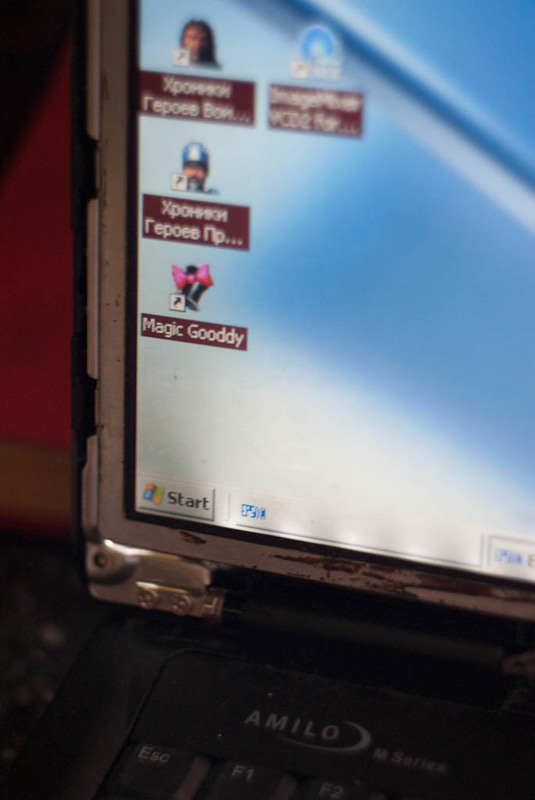 После переустановки Windows у меня возникла проблема – не хотел запускаться в общем-то неплохой Jabber-клиент Gajim. Скорее всего, дело в отсутствии каких-то библиотек, которые просто “забыли” включить в инсталлятор. На форуме поддержки (дохловатом) ни один из разработчиков так и не смог воспроизвести баг, так что можно предположить, что эти библиотеки могут устанавливаться каким-нибудь другим софтом, использующим GTK. Хоть я и не одинок с этим багом, но разработчики о его существовании, кажется, и не догадываются. По первому пункту “отпали” монстры типа Миранды или QIP Infium, по второму – довольно популярные Tkabber, Exodus и JAJC. Psi почему-то не захотел работать с вручную указанным сервером. Для более-менее серьезного тестирования остались Pidgin, Spark, Pandion и glu (xeus). Первые два клиента оказались слишком требовательны к ресурсам (как напоминает Сектор Газа – “Ява, Ява, отсоси, раззява” :) ). Кроме того, Spark непредсказуемо зависал. 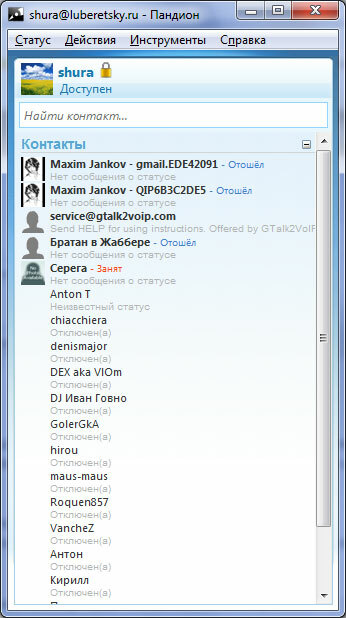 Glu, несомненно, довольно красив, но интерфейс уж слишком непривычен. Все-таки четыре цветных кнопочки в заголовке не вызывают ассоциаций с “уменьшить, развернуть, закрыть”. “Самым лучшим” jabber-клиентом оказался Pandion. Он вполне удовлетворял моим требованиям и не зависал по поводу и без повода. Хочу сразу разочаровать любителей “свободных операционных систем”, но Pandion работает только в Windows 2000/XP/Vista/7. “Красивости” интерфейса отображаются с использованием браузера Internet Explorer, но ядро программы написано на C++. Такая технология называется Rich Desktop Application. Для пользователя это означает лишь то, что Pandion может не запускаться на некоторых “сборках” Windows XP, где уродом-сборщиком зверски вырезан стандартный браузер. Кроме того, Pandion не подойдет тем, кто по религиозным соображениям не приемлет браузер Internet Explorer. Остальным же достанется бесплатный jabber-клиент с красивым и понятным интерфейсом и поддержкой всех основных возможностей протокола. Конечно, здесь нет такого обилия настроек, как в том же Gajim, но они подавляющему большинству пользователей просто не нужны. Клиент нормально русифицирован, прекрасно работает с кириллицей в сообщениях. Судя по разделу справки “Deploying Pandion”, авторы серьезно рассматривают возможность использования своей программы, как “корпоративного мессенджера”. Если кто-то собирается устанавливать корпоративный jabber, то Pandion – неплохой выбор для клиентской программы. “Лишних” функций в нем нет, а имеющиеся обеспечивают необходимый минимум, удовлетворяющий большинство пользователей. Точно так же Pandion подойдет и для домашнего использования. Любителям же “бороться с системой” (где под системой понимается не какая-нибудь латиноамериканская хунта, а Windows или Linux) надо использовать несколько другие программы. Собрав три десятка страниц подписей всевозможных “военных”, “летчиков”, “белокурых рыцарей Рейха”, “разжалованных из адмиралов юнг” и прочих “пиарщиков”, правозащитники фундаментально огородились и подписи собирать перестали. Видать, собрали достаточно. Поможем правозащитникам своими подписями в других местах? Уже подписались адмиралЪ Александр Колчак, моряк Карл Дениц, доктор философии Дирлевангер, кондукэтор Антонеску, капитанул Кодряну, проститутка Иванова Марь Ивановна и прочие достойные и не очень личности. Сегодня в “Перекрестке” увидел, как две девочки “среднего школьного возраста” покупали примерно 20 пивных кружек с рисунком типа “Тяжело в учении – легко в бою”, видимо, в качестве подарка одноклассникам на 23 февраля. Кагбэ такие подарки обычно согласовываются с каким-нибудь “родительским комитетом” или с классным руководителем. Выглядит все это странно, как разрешение школьникам пить пиво, причем подкрепленное “официальным органом”. А вы верите, что пацаны будут пользоваться этими кружками, употребляя пиво за углом школы и решая сложный вопрос – прогулять урок или не прогулять? 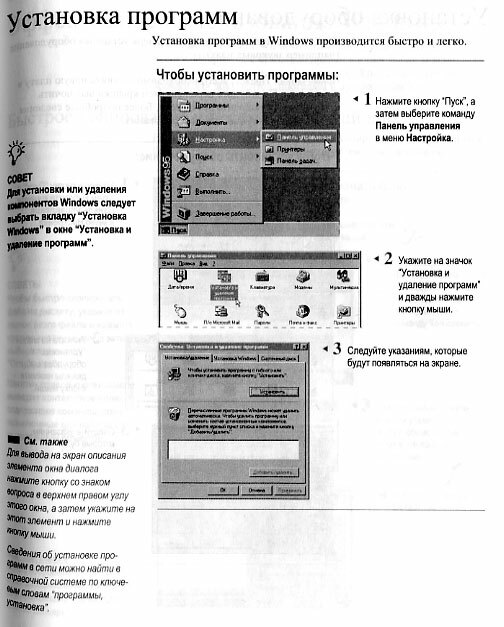 Подходит к концу установленный Microsoft срок тестирования Windows 7 Release Candidate 2, люди Билла Гейтса рассылают участникам тестирования письма с напоминанием о том, что они используют бета-версию с ограничением по времени работы и предлагают купить лицензию. Народ возмущен – оказывается, в их лице Microsoft получила армию бесплатных тестеров, и требуют себе пачку лицензий бесплатно. Удивляет, что никто из возмутившихся так и не удосужился подумать, для чего был выпущен Windows 7 RC2. В RC-версиях уже исправлены основные ошибки, и предназначены они, выражаясь буржуйским языком, для IT Professionals – программистов и системных администраторов. Первым необходимо устранить возможные несовместимости в программах, вторым – протестировать новую ОС совместно с используемым “корпоративным” ПО. Ни о каком “бесплатном отлове кучи багов” речь не идет. Думаю, во многом благодаря выпуску RC2 при выходе Windows 7 для подавляющего большинства популярных программ были выпущены обновления с поддержкой новой ОС. Всяческие линуксоиды очень высоко ценят существующую в их Линуксах (точнее, популярных дистрибутивах Линуксов) системы “пакетов”, позволяющую устанавливать, обновлять и удалять программы через единый интерфейс, при этом утверждая, что в Windows этого никогда не было. Вопрос: почему выполняющий очень схожие задачи “менеджер пакетов” преподносится линуксоидами как гениальное творение, не имеющее никаких аналогов? PS Да, и при всей своей нелюбви к компании Apple, могу заметить, что их App Store нет равных. Только гений маркетинга мог догадаться объединить каталог софта с платным членством и менеджер пакетов, да еще и сделать его единственным штатным средством для установки программ. PPS Вы конечно понимаете, что “гений маркетинга” – это такое ругательство. С удивлением обнаружил, что мой нелюбимый провайдер Искрателеком вырубил ограничение скорости для клиентов при соединении с серверами Speedtest. При положенных по договору 6 Мбит/с (это минимальная скорость в Московской области, стоит 500 рублей в месяц) скорость соединения с серверами Спидтеста достигает десятков мегабит. Сегодня увидел в reCaptcha слово Calve (обратите внимание, что картинка генерируется сервером reCaptcha). 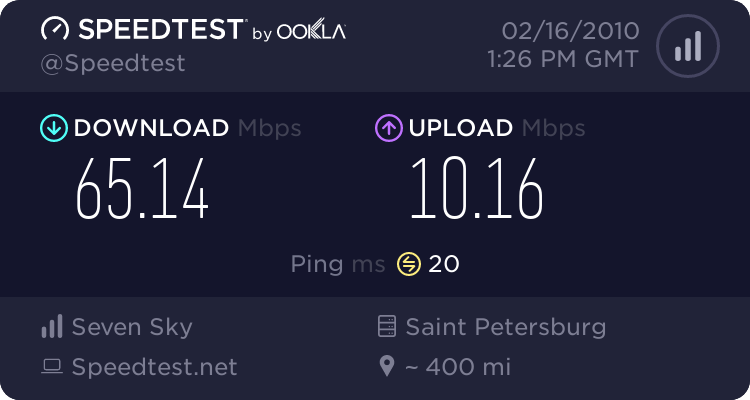 На днях набрел на сайт vertor.com, то бишь Verified Torrents. Сайт занимается тем, что проводит поиск по каталогам торрентов, скачивает аудио-видео файлы и вырезает из них кусочки для ознакомления. Ни для кого не секрет, что очень часто на посещаемых испортных трекерах из непонятных побуждений выкладывают какие-то непотребные файлы, вроде записи с видеокассеты на уродском языке под видом DVDRip со всеми мыслимыми и немыслимыми дорожками. Если, к примеру, на torrents.ru за порядком, то есть обязательными скриншотами и иногда – семплами следят специально обученные модераторы, то у буржуев для этого завели специальный контролирующий орган. Ресурс позволяет получить какое-то представление о содержимом раздачи, что довольно полезно. 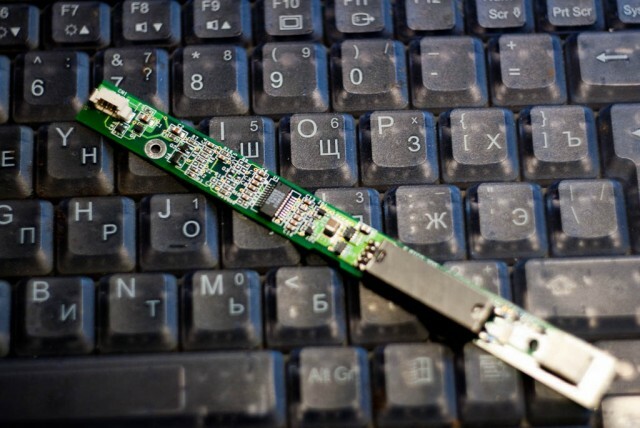 На одном заграничном поисковике торрентов (не каталоге, типа Pirate Bay или Demonoid, а поисковике по другим трекерам) нашел забавную штуку. Вместо скачивания торрентов там предлагается альтернативная штука – Download from Web, представляющая собой простенький торрент-клиент на Java под названием Bitlet. Если кто-то из читающих меня собирается делать свой торрент-трекер с блекджеком и шлюхами для школьников и блондинок – дарю идею, очень полезно для приобщения к торрентам тех, кто не желает разбираться во всех этих сидерах и личерах. По на водке legatus_minor приготовили блюдо, которое англичане называют Beef Wellington, а французы – filet de bœuf en croûte. Есть мнение, что в сильно искаженном виде это у нас называют “мясом по французски“. …и получить призы на каком-нибудь кинофестивале. 10 советов от французских специалистов. Кстати, ролик дает представление, как воспринимают русское кино западные зрители. 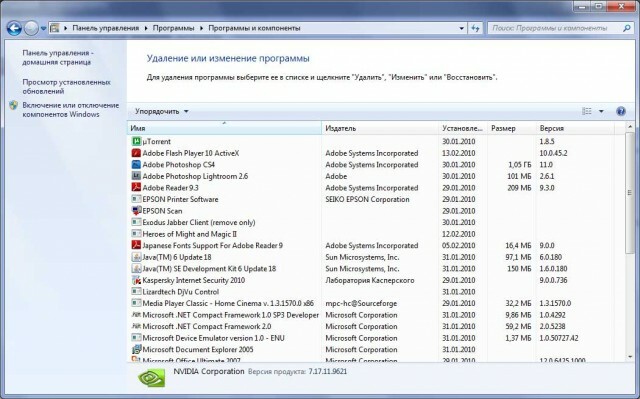 Камрады, а нет ли у кого-нибудь инвайта на demonoid.com? Скиньте, плиз, на shura@luberetsky.ru. Есть инструкция по сборке (на английском языке, с картинками): http://alspix.blog.co.uk/2005/12/31/matchbox_pinhole~428481/. Как ни странно, такой камерой можно делать “вполне приличные” снимки. 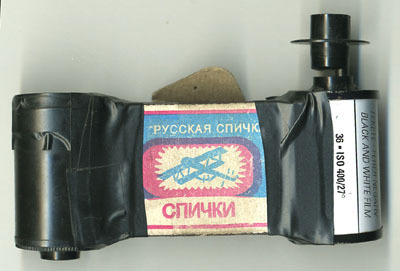 Из недостатков – маленькая светосила “объектива”, около f/90. Напрашивается “модификация” в виде приклееной “Моментом” гайки для штатива. 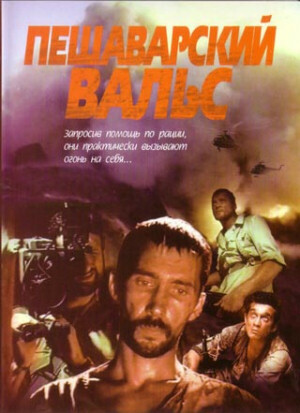 Посмотрел фильм “Пешаварский вальс”, снятый в 1991 (иногда указывают 1994 год, когда фильм получил несколько наград) году Тимуром Бекмамбетовым (его режиссерский дебют). Как ни странно, фильм в России практически неизвестен. Кинопроката в 1994 году, как вспоминает режиссер, не было, “в кинотеатрах были мебельные салоны и магазины запчастей”. При этом картина получила призы на фестивалях в Карловых Варах и Сан-Ремо. Следствие этого – почти полная невозможность найти фильм сегодня. И у arjlover‘а (кто не знает – крайне рекомендую), и на торрентах лежит довольно страшная копия, возможно, даже “экранка”, со странной озвучкой (половина на русском, половина на английском со страшноватым переводом, знакомым по видеокассетам, это не говоря об убитом качестве звучания) и “жестко” вмонтированными английскими субтитрами. DVD, насколько я понимаю, не выходил. Как положено в отечественном кинематографе, “фильм основан на реальных событиях”. В основу сюжета положено восстание советских пленных в лагере Бадабер неподалеку от пакистанского Пешавара. В 1985 году группе советских пленных удалось завладеть оружием и большим складом боеприпасов, перебить часть охраны и выдвинуть свои требования – организацию встречи с представителями советского или афганского посольств в Пакистане, а также с представителями Красного Креста. Естественно, ни Пакистан, на моджахеды под командованием Бурхануддина Рабани на это пойти не могли – иначе это означало бы, что формально нейтральный Пакистан участвует в войне в Афганистане на стороне моджахедов. Начался штурм лагеря силами моджахедов и пакистанской армии, с участием американских военных инструкторов. Штурм окончился неудачей, по данным, опубликованным ГРУ ГШ ВС СССР, были убиты около 100 моджахедов, 6 иностранных советников, 13 представителей пакистанских властей, 28 офицеров ВС Пакистана. После этого начался обстрел лагеря, закончившийся взрывом склада с боеприпасами – по одной из версий, его подорвали сами восставшие, когда исход боя стал ясен, по другой – взрыв произошел из-за попадания снаряда или выстрела РПГ. Естественно, в фильме все подано, мягко говоря, немного иначе, да еще и с уклоном в сторону “как будет интересно жюри кинофестивалей”. По фильму, в лагерь военнопленных приезжает западный журналист вместе с врачом, для того, чтобы сделать интервью с захваченными советскими солдатами. Журналист, кстати, омерзителен с первых минут фильма, когда он задает вопросы типа “участвовали ли вы в карательных операциях”. Воспользовавшись “нештатной” для охраны ситуацией с интервью, пленники захватывают оружие, убивают охрану и пытаются сообщить о своем местонахождении. Им удается найти работающую рацию, по которой они связываются с советскими войсками. Стоит упомянуть, что фильм снят в угаре перестройки, поэтому отдает махровой антисоветчиной. Кстати, “антисоветчина” – мощное заклинание, дающее +20 баллов к успеху на импортных фестивалях, другая его разновидность – “злобные непонятные русские”. Между прочим, и импортный журналист, как более-менее “свой”, понятен западному зрителю и крайне способствует успеху. С другой стороны, говорить о том, что произошло бы “на самом деле” тоже нельзя. Никакого “выхода в эфир” военнопленных не было, как не было и показанных в фильме переговоров с представителем американских вооруженных сил (который тоже убеждал сдаться, утверждая, что Советский Союз отказался от своих пленных). Восставшие, забаррикадировавшись в подземных катакомбах “тюрьмы”, ожидают штурма. Врача и журналиста они пытаются удерживать, как заложников. Финал фильма – продолжение “перестроечной чернухи”, по базе наносят бомбовый удар советские же вертолеты, чтобы окончательно “замести следы”. Это уже полный “художественный вымысел”, советская авиация никогда не “работала” по объектам на территории Пакистана, что и позволяло моджахедам чувствовать себя там в безопасности. Правда, есть озвученное в интернетах мнение, что вертолеты “по фильму” пакистанские, а мелькнувшая в одном из кадров красная звезда – это “ляп”, но как-то оно не стыкуется с общим “чернушным” настроем. В целом, фильм снят неплохо для “перестроечного кино”, что нехарактерно для наших режиссеров, в нем присутствует довольно активное действие. Озвучка довольно необычная для нашего кино, отличающегося какой-то странной боязнью слова “хуй”. Как мне кажется, нет ничего удивительного в том, что солдаты говорят матом, посылают в известном направлении журналиста с его вопросами и вообще ведут себя не так, как принято на светском рауте. Конечно, действие довольно сумбурное, состоящее в основном из беготни по подземным коридорам, но в целом фильм не уступает по зрелищности “среднему боевику на VHS”, какие, видимо, и послужили своеобразным “прототипом”. Портит все жуткое качество копии, а особено – “перевод” некоторых фраз на английском. Оказывается, воевали в Афганистане с “муджахиддинами”. Кроме того, иногда голос переводчика заглушает реплики героев на русском. Окончательный вердикт – смотреть стоит, как пример относительно нормального “перестроечного кино”. 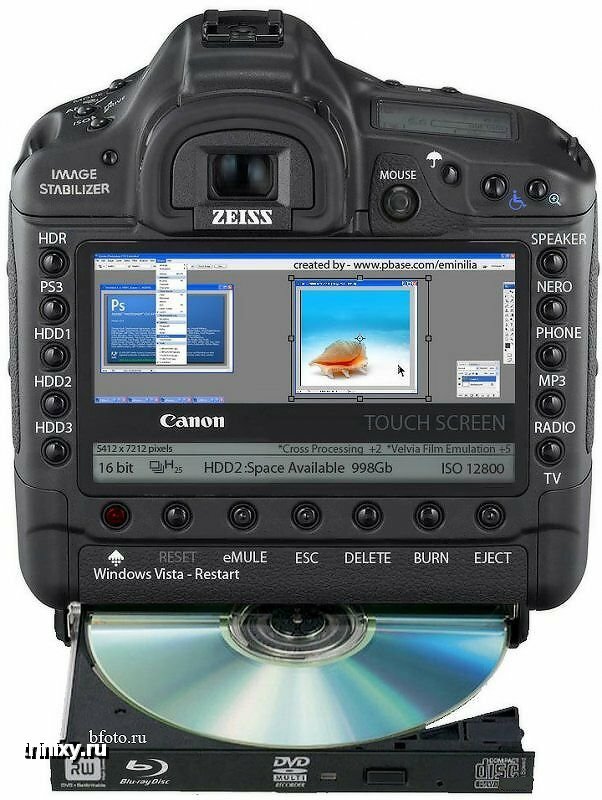 PS Ожидаю срача Canon vs. Nikon. PS/2 Если что, у меня Sony.